Shipping, tourism, fisheries, oil and gas, and renewable energy all depend on the sea; as does the Earth’s health. Find out where you fit in and discover how data from space adds value to this $multi-trillion sector. The ocean economy has been described as the next economic frontier. Energy, food production, novel biomaterials, transportation, logistics, recreation…the list of commercial opportunities derived from the world’s seas is endless. This also highlights the dire need to protect and sustain global ocean systems. The participants in this session each used their time to touch upon the various aspects of ocean opportunity, risk, and technology. 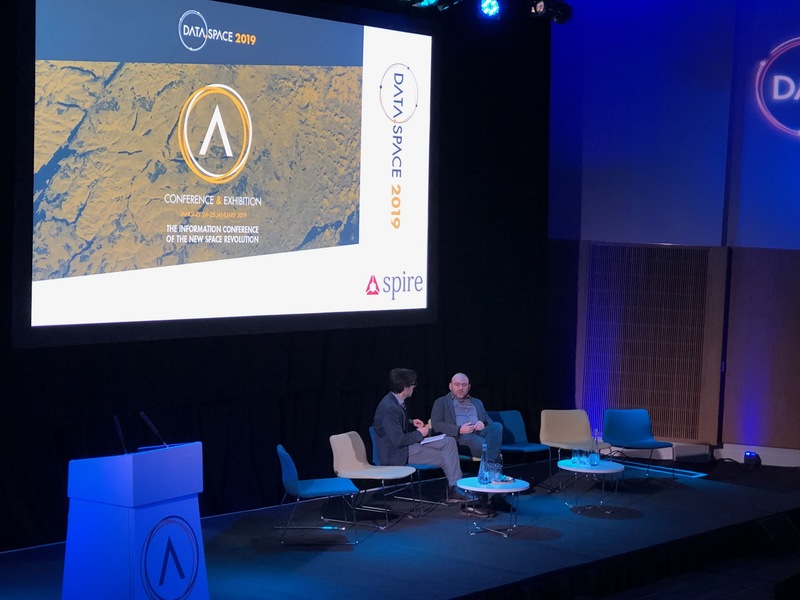 Spire CEO Peter Platzer immediately confirmed this as his discussion emphasized the importance of the oceans in global commerce, and he provided plenty of examples around risks, including issues related tonew transport corridors, illegal fishing, the difficulty in tracking vessels, and 21st century piracy. Spire’s technology monitoring platform can help commercial players towards the management of both financial and resource issues affecting their operations, but it can also aid in the sustainable development and preservation of ocean resources, so there is a clear societal benefit. For me however, the most interesting part of Peter’s dialogue came when the moderator asked why we could not look at the issues related to ocean resources outside of the context of money. Peter’s response was, I thought, fascinating and on point. He proceeded to describe how in the natural world, every interaction between predator and prey was a transaction of sorts, in the effort to preserve genes (essentially evolutionary fitness) and maximize potential success of progeny. Aside from the fact that the evolutionary biologist in me loved this response, it makes perfect sense. This is also why economists, market analysts and data scientists should abandon many traditional methodologies and look to the natural world for more relevant and useful insights (for example, read papers by George Sugihara – more about this later). You do not need to live in a coastal region to recognize the importance that ocean issues exert on our lives. Much of what you purchase was likely shipped across one or several ocean systems, a sizable percentage of your food intake may have been sourced from the ocean, and the energy to power your vehicle or heat/cool your home may have originated offshore. But since we live on terra firma, we rely on remote sensing and data collection to guide decision making regarding the physical, biological and economic dimensions of ocean systems. The more data that can be collected, curated and distributed regarding the multifaceted dimensions related to global oceans, the better we will be able to capitalize on the opportunities and manage the associated risks. Just as space funds have started to increase in recent years, I expect to see the same with respect to oceans. +This post ties directly into a theme that I am incorporating into a forthcoming technical paper (The Answers are in the Oceans). Will update when this paper is complete.